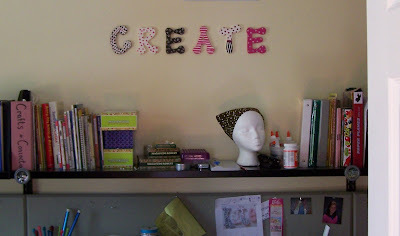 Inspired by some fantastic Etsy artisans, Annie and I scooped up some .50 letters at Joann’s a couple of weeks ago. Annie went to town with acrylic paints and we have a defining theme for our craft room/office. I think this would make a great gift for someone. You could simply give a monogram letter or even give the letter and some paint as a DIY kit, as we did for a recent 13 year old birthday party. Oh my! What a great idea! That’s a really creative, inexpensive gift idea! Thanks! Those letters look great. I’ve seen them at Michael’s and Joann’s but never knew what to do with them. I love the idea of giving them as a DIY gift along with paint. Yeah, another PEAR!!! French picnic loves you! So glad you came over to Bee Wise Bags, I think we craftilicious girls have to stick together!! Thanks for joining the fun, I’m so glad to find you blog! I love those sock! I love this idea! Maybe I’ll try one for a Christmas gift!